What a palava! I’m sure every bird owner says to themselves, this would never happen to me, but last Saturday it did. Left the door open to freshen the flat up a bit and completely forgot to close it when I went to feed the birds. As I opened their cage one of our cockatiels (Al – the smaller grumpy one) flew right past me, straight out the door and up into the wide world beyond. Recovering from the initial shock I legged it up the road and followed his screeching as far as Western Road, where he was perched on a window sill on the top floor of the flats near Sainsbury’s. A concerned passer by informed me the noises he was making were as a result of fear before wishing me luck with catching him. 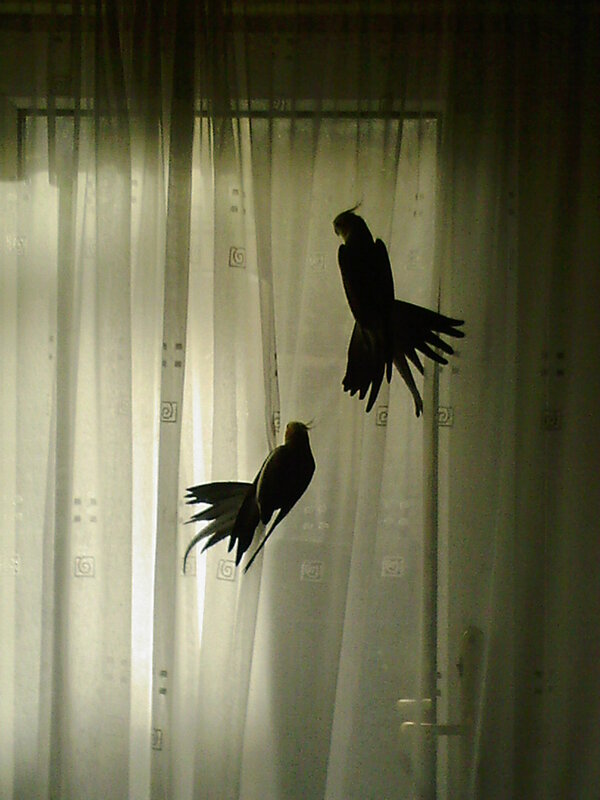 Just then a tattooed arm emerged from the window of the sill he was on and made an attempt to catch him but he flew off again…. I followed him up the hill but lost him somewhere behind the car park in hampton place and could hear his screeching no more…… That’s it I thought, the seagulls will get him for sure. I went home, called the RSPCA and spoke to a very understanding man called Tim, who advised me to leave his cage out by an open window as birds often come back of their own accord. I wasn’t too hopeful but I couldn’t stay in so I went out looking again, and though I spotted a lot of pigeons and seagulls I couldn’t see or hear our bird anywhere. Dejected I gave up and went home.It was already getting dark and I was sure Al was destined for that great big cockatiel perch in the sky. 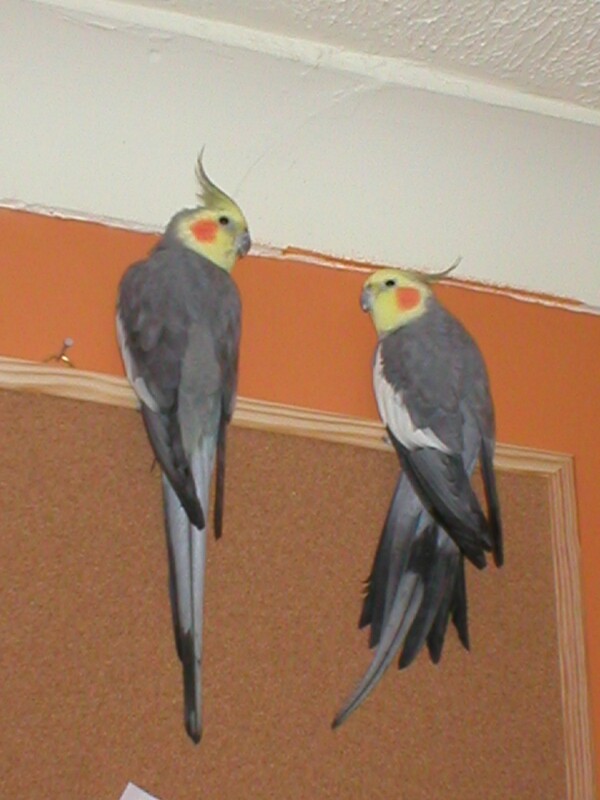 When I got home I hastily made up some posters asking people to contact me if they had seen him anywhere and was just about to go out again when the phone rang – it was Tim from the RSPCA and had I reported a missing cockatiel? Well he was sitting right next to him! A lady had found him, tired and confused in the St Mary Magdalen church and had driven him over to the RSPCA shelter in Patcham. He was a bit concussed, they believed, as he was very quiet and subdued, but otherwise he seemed none the worse and I could come over and collect him straight away. One taxi ride over to Patcham later and he was soon back home, reunited with his brother and up to his old tricks of hissing and biting anyone who comes near. I said he was a grumpy bird but we wouldn’t change him for anything and I am very grateful to the kind lady who rescued him and to the RSPCA. Thank you! These two chaps were adopted from a lovely lady called Pat. They are both about 8 years old and are called Vic and Al. They love listening to marc almond but freak at the sound of police sirens.